King Solomon was the absolute ruler of his realm, but in his Proverbs he advocated dealing fairly with the poor. For him, riches weren’t automatically a mark of virtue. “Better is a little with the fear of the Lord, than great treasures without content,” he say in Proverbs 15:16. As those divisions between the rich and poor – or at least poorer – are driving debate about proposed changes to the real estate tax code – particularly the prized mortgage interest decuctio0n. 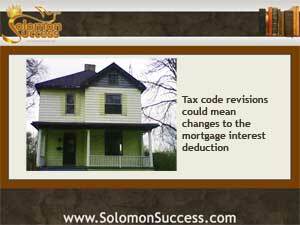 The mortgage interest deduction has been around since 1913. As the law stands now, property owners, both residential and investors, can deduct up to $1 million of the interest paid on their mortgages, plus up to $100,000 in interest on home equity loans. That applies to a primary residence as well as to second homes, and to investment properties as well. Proponents of the deduction say that it helps to support home ownership by helping homeowners offset costs of a mortgage and encouraging people to take out mortgages. Kohn, Marc. “How the Mortgage Interest Deduction Could Change.” CNBC Finance. CNBC.com. 10 July 2013.